Purpose: Use this document as a reference for modifying unapproved requisition lines in ctcLink. Local business practice determines the requirements for adding requisition information. The following guide presents the basics of this procedure in ctcLink. Note: Making changes to an approved requisition may require additional steps and approvals (depending on the changes). The local procurement office can provide additional information on that process. The following instructions apply to making changes to a requisition that has not yet been approved. On the Requisitions page, click the Find an ExistingValue tab. Enter a Requisition ID and click Search. If the ID is unknown, use the search fields. For example, to search for all of the requisitions created by a particular requester enter the Business Unit and select a Requester. Click Search. 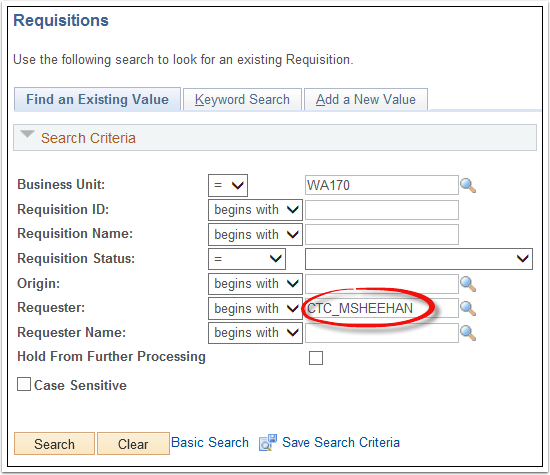 Requisitions matching the search criteria will be displayed in the Search Results grid. Select a requisition in Open (unapproved) Requisition Status. On the Requisition page, modify the requisition as needed. To submit the requisition for approval, click the Approve icon at the top of the page.